James Barber, the Urban Peasant, got it right. Sharing a hot pot of ginger tea draws people in and opens conversations. A lovely way to make new acquaintances. For me it was soup. Last year our son’s elementary school was soliciting silent auction items for a fundraiser. When schools are on the crackdown for cash, they’re pretty happy about any kind of donation: food, gift certificates for stores, services, restaurants. I don’t like canvassing for donations so I couldn’t see myself doing that. I had squeezed out a few knitted items to donate. I desperately wanted to donate something unique, creative and meaningful. Then I came up with an idea for a personal service: The Soup of the Month Club. For one year, I would deliver soup once a month to the Soup of the Month Club household. It would be made entirely from scratch and catered to the food preferences of the recipients using seasonal, local ingredients whenever possible. In our fast-paced, busy lives, it’s hard to find time to slow down, cook and share a meal. I wanted to create a time, even though it would be only once a month, where parents wouldn’t have to worry about what to make for dinner and the family could sit down, share a nourishing meal and build community around the table. So I submitted my auction item, not knowing if anyone would be interested since it’s not the run-of-the-mill donation. I was pleased that there were bidders! The winning bid was made by a family of four who lives just a few blocks away. I was ecstatic that I was able to help the school raise some funds and that I could provide a family in our own neighbourhood with a nutritious meal once a month. Little did I know that our family would be forging a strong relationship with this family. Over the year we’ve come to know and love the family I supplied soup to. I’ve discovered that we’re on the same wavelength about a lot of parenting, community and food issues. At the kitchen table, we’ve shared many a deep conversation about community building, politics and of course, food. And we’ve shared many, many laughs. Amazing what kinds of friends you can make with a few pots of soup. In a large pot, heat olive oil over medium-high heat, add onions and sauté until translucent. Add garlic and stir until fragrant. Add potatoes, carrots and celery and sauté for a few minutes. Add lentils, broth, water, tomato purée, thyme and bay leaves and bring to a boil. Turn down heat and simmer until lentils are soft and veggies are tender, about 35 to 45 minutes. Add a bit of water or broth if the soup thickens too much. Fish out the thyme and bay leaves. Season with salt and pepper. Serve with a good sprinkle of chopped parsley. Here we are, twelve years after our first post on VanEats. Twelve years of celebrating food and life adventures. And what an adventure it’s been: Roland and I married, became parents, changed careers, travelled, cooked and ate. Mostly with a mini-epicurean in tow. So life took over and we took a long hiatus from VanEats. The world outside our own little vortex has changed exponentially during our break. The blogosphere has exploded. Social media is everyone. And the world of food blogging has evolved beyond all expectations. Now it’s time for us to pick up where we’ve left off. We present to you, VanEats at Home. While we haven’t been food blogging, we’ve been more involved with the food world than ever before. We devote a lot of our time to cooking, learning about where our food comes from, growing our own food and teaching our child and others about food literacy. It’s a luxury we are blessed with and hope that we can share it with readers. VanEats at Home focuses on our daily food life from our trials and tribulations as new food gardeners to the fantastic things we cook to food in our community. You’ll notice a trend towards eating locally and sustainably and towards cooking from scratch. You’ll find more words, stories and recipes than photos (we leave beautiful food photography to the pro’s) as we channel our energy into developing a dialogue about our everyday love affair with food. Pull a chair up to our table and settle in for a nibble. I have an irrational bias: cereal. Boxed breakfast cereal. Highly processed, overpriced boxed breakfast cereal. I don’t like it. I understand that families are time challenged in the morning and rely on quick, straight-out-of-the box breakfasts. Cereals make the promise of containing “18 essential nutrients” but I’m not convinced. Because cereal is so highly processed, they actually have to add back the nutrients that get processed out of the grains they started with. Kind of counterproductive in my opinion. And then there are the cereals with the extra added bonuses like sugar, colour, artificial flavouring, artificial aromas, etc. As a result, I don’t buy cereal often. And when I do, I read labels and look for whole grain, lower sugar, lower sodium varieties. And I feel guilty for feeding into the cereal manufacturing vortex. The other day I had a bit of a dilemma. I wanted to make crispy rice squares, the first time in probably 6 or 7 years. I bought a package of organic crisp rice cereal. OK, it’s organic, low in sugar, made from brown rice but I still felt guilty about supporting big food processors. I also felt guilty knowing that they processed the bejeezies out of rice to make the perfectly uniform crisp rice bits (don’t think that those are individual rice grains all puffed up–they’re not!). And of course the marshmallows are purely processed, good-for-nothing high-fructose corn syrup. I need to just let my hair down and live a little. I am deeply sorry to disappoint the Rice Krispie purists out there but I’m going to be the party pooper. I made crispy rice squares with a healthy, sophisticated angle…replaced some of the cereal with toasted oats, dried mango and toasted almonds. I served these up to the boy to great relish. I served them up to the neighbour kids who inhaled them with glee. Serve them up to your gang and see if anyone notices. Line an 8” or 9” square pan with foil and butter well. Set aside. In a large pot, melt butter over medium heat and continue to heat until solids start to brown and butter smells nutty. You will notice the butter sizzle as the water cooks away. Just before the butter browns, it will form a fine froth. I am being totally facetious using brown butter but it adds a certain je ne sais quoi. If you don’t care for this, just melt the butter. Remove the pot from stove and add marshmallows. Stir until they are completely melted. If the pot cools down too much, return it to low heat and keep stirring. Add vanilla and stir well to combine. Add the rest of the ingredients and stir well to coat all the dry ingredients. Pour into prepared pan. Grease your hands with more butter and press mixture firmly. Let cool to room temperature and cut into 9 or 16 squares. There are celebrities, then there are celebrities. Real celebrities. The people in your life that are not necessarily famous but shine brighter than any Hollywood star. I’m lucky to have folks like that in my life. People I can embrace and soak in all their generous energy and grace. My sister-in-law is one of those celebrities. She’s one of those people that gives endlessly, asks for little and is grateful for every moment. A true star in every sense. Because we don’t live in the same city, time with her is precious and we can never have enough time to fit in all the things we want to do together. We did, however, have a chance to sit down to lunch late last spring…in Antwerp. Belgium. Two sisters who live a continent and an ocean apart. How often does this opportunity arise? We had to celebrate with a plate of Flemish asparagus and a rosy glass of cava. Perfect food for celebrities. Lightly steam asparagus to your liking. If you are lucky enough to get your hands on white asparagus, you’ll need to cook them longer until they’re very tender. In the meantime, melt the butter in a small saucepan over low to medium heat. Once your asparagus is plated, add the hard cooked eggs to the butter and warm gently. Season the butter mixture with parsley, a squeeze of lemon juice, salt and pepper. 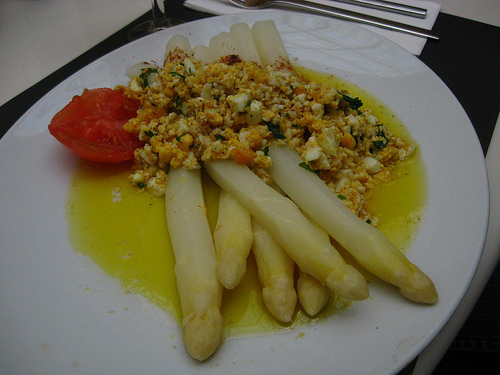 Adorn the asparagus generously with the egg and butter sauce, garnish with paprika if you like and serve right away. Cava optional but highly recommended. I didn’t grow up knowing rhubarb. I imagine that it simply was not something my family new anything about. I remember reading about rhubarb in my teens and thinking, “Oh, why would one bother eating something so tart and stringy? Meh.” I wasn’t really intrigued, the way I was with artichokes or sushi or Indian food, none with which my family was familiar either. As a young adult I ventured out to Ontario to complete a year-long internship program in a small town. It wasn’t really a small town, but being a “big city gal,” I felt stifled in this small city. I truly believe, though, that everywhere you go, there is something charming and lovely that you come across. It was hard to find this something charming. The house I rented was lovely–about 90 years old with stained glass windows. And the southern Ontario thunderstorms were grand. But I was still waiting for something to really charm me. Then one day in the cafeteria I spotted little dishes of rosy rhubarb crumble. And I was intrigued. I bought a dish with my hard-earned, measly stipend and tucked in. My tastebuds jolted with the tart, herbal aroma of the rhubarb, cut gently with chunks of sweet apple and soothed by the crumbly brown sugar topping. I was hooked. How could I have missed out on this all my life? I’m making up for lost time now. Rhubarb is one of the first signs of Spring and hails the promise of longer, warmer days and a plentiful growing season. I scoop up great armfuls at the market and at our community garden and transform it into culinary delights to enjoy now and later in the year. Sometimes later acquaintances make for lifelong friends.